As we all know, all good things must come to an end, and while the power of social media marketing won’t drift away any time soon, it’s time to end my three-part blog series about getting started with LinkedIn marketing. 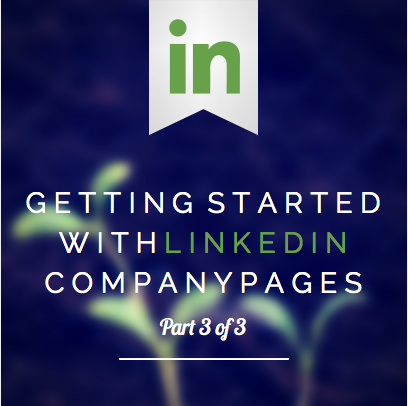 In parts one and two of Setting Up Shop on LinkedIn Company Pages, I briefly explained how to create a LinkedIn company page and how to jump start building your following, as well as how to manage your page and what types of content to share. In the final piece of Setting Up Shop on LinkedIn Company Pages, you’ll learn about LinkedIn marketing engagement and analytics—two of the most critical aspects of successful social media marketing. The main goal for sharing content on LinkedIn or any social media platform is to drive engagement and buzz around your posts so that your prospects will consider your business as thought leaders in your industry, establishing a feeling of trust with your audience. So, what happens when you start producing great content that generates feedback? You get the chance to engage one-on-one with your followers and prospects! When you receive feedback on one of your LinkedIn company page posts, you will get a notification while logged into your personal account that will lead you to any comment or feedback with the opportunity to respond. Answering feedback in a timely manner will not only be appreciated by your followers but will also establish credibility and keep your business at the top of your followers’ minds. Even if you have a hectic schedule and can’t find the time to check your account each day, a simple response such as saying“thank you” will go a long way. On that note, always be thankful for any recognition a follower has given you and keep that feedback in mind for sharing future content. Gauge what type of response you receive on a specific topic and base your content schedule off of what has proven to drive feedback in the past. In addition, be sure to return the favor and give feedback to the valuable content that your followers produce as well. This will not only help you build trust with your audience but will also show that you have an interest in building new professional relationships. Remember that social media is meant for being social… and your followers will appreciate your effort. Many business owners stress their concern about sharing any content because of the possibility of negative feedback—but I can assure you that any unwanted or inappropriate comments can be deleted by an administrator who manages the page, or can immediately be resolved in a positive light by the company responding to the negative comment. You have absolute control over what content is visible on your page. I would be more worried about not receiving any feedback at all than receiving negative feedback. And in the event that a negative comment is posted to your page, you have a great opportunity to show off your customer service skills for the public. If a customer is unhappy with your product or service, this is your chance to make it right. So you’ve put all this time and effort into your social marketing strategy and tactical plan, but how do you know if the content you’re sharing is actually effective for your audience? The answer is analytics, of course! To access your company page analytics, visit your company page while logged into your personal account and navigate to “analytics” on the top of the page to the right of the update field. Click on “Analytics”, and you’ll be able to get a glimpse of how many impressions each post received, how many clicks it generated and more. Impressions are how many times your article was seen by your network. The higher the number, the better. This will allow you to learn what types of content are preferred by your audience so you can tailor your future content strategy accordingly. Your analytics page will also give you an idea of the demographics of your followers and follower trends to further help you tweak your social media strategy and content schedule to their needs—providing you with information about their job position level, location and more. You’ll also have access to information that compares your page to your competitors’ pages to see where you measure up in regards to your LinkedIn presence. For example, if the majority of your network is comprised of marketing managers, you’ll want to make sure you share content that appeals to their needs. While LinkedIn marketing can go much further in depth than the basics that I’ve just outlined in this entire series, the above instructions will get you on your way of incorporating this platform into your overall online marketing strategy. As long as you can determine the types of content that your target audience will enjoy and you commit to a consistent schedule, your network will continue to grow— along with your website traffic, lead generation and sales. Remember that the more effort you put in social media marketing, the more you’ll get out of it!